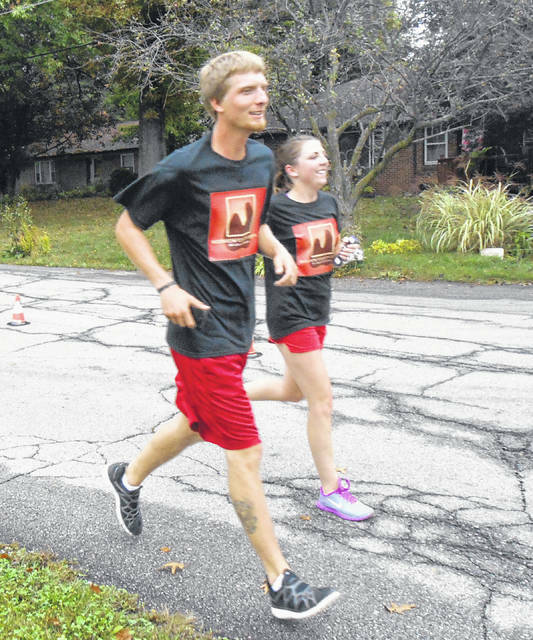 Runners from Morrow Dental finish a past Community Center 5K with a smile. Morrow County Community Center and the Mount Gilead Cross Country Team are working together to present the 5/10 K Sweetcorn Festival Run on Saturday, July 21. This is the first year a 10K race has been offered in Morrow County and the first time 10K runners in the county have had an opportunity to compete for a cash prize. Race Chairman Jake Hayes is excited to announce the prize purse for the 10K totaling $2,200. The top male and female prize purse is $450 with lesser amounts for second through fifth place and a half-way prize for both male and female. All race participants who register before July 13 will receive a Sweetcorn Run Tee Shirt. Hayes said that you can get the “early bird” fee pricing by using the code “Sweetcorn2018” when you register. All 10K finishers will receive a medal and engraved glass. Medals for the 5K will be given to the top three in each age group. You can pick up a registration form at the Morrow County Community Center at 16 S. Main St. in Mount Gilead, the Mount Gilead Municipal building, the Cardington Public Library, Selover Library in Chesterville and Perry Cook Library in Johnsville. Registration forms for the race can also be downloaded from the website: www.sweetcornfestivalrun.com. Both the 5K and 10K runs will begin at 9 a.m. at the former Save-a-lot parking lot at 100 W. High Street and Iberia Street. Packet pickup will be Thursday, July 19 from 9 a.m -8 p.m. and Friday, July 20 from 9 a.m-8 p.m. at the Morrow County Community Center. If you cannot make it to a pickup time, please contact the race director, jhayes@mgschools.org. The race course will close at 11 a.m. and runners are invited to enjoy the Sweetcorn Festival activities. Saturday, July 21, Check-in 8:30 a.m. Race start 9 a.m. Details at: www.sweetcornfestivalrun.com and www.mccommunitycenter.org.